but im not quite happy with the results... and i having a hard time to align the images in photoshop! The cameras are new, same settings, same picture from the same angle, and the lens distorcion seems quite different. I thougth I made a mistake and I left one of the camera with more zoom, but i double check and still, cant align the images. Already try using PTgui, but still no success. A) Is there any opensource software to align the 2 images one over the other one ? 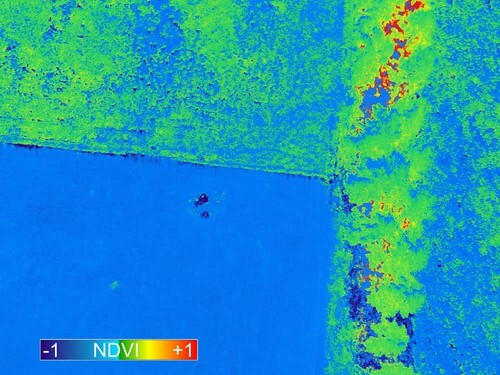 B ) Is my NDVI calculation correct ? i don´t see the results ... is there any software that realizes this task easily ? Your UAV photo pairs are great quality. They are sharp and rectify with each other easily. I used Ned's Fiji plugin to align the pairs and make NDVI images which look biologically meaningful. 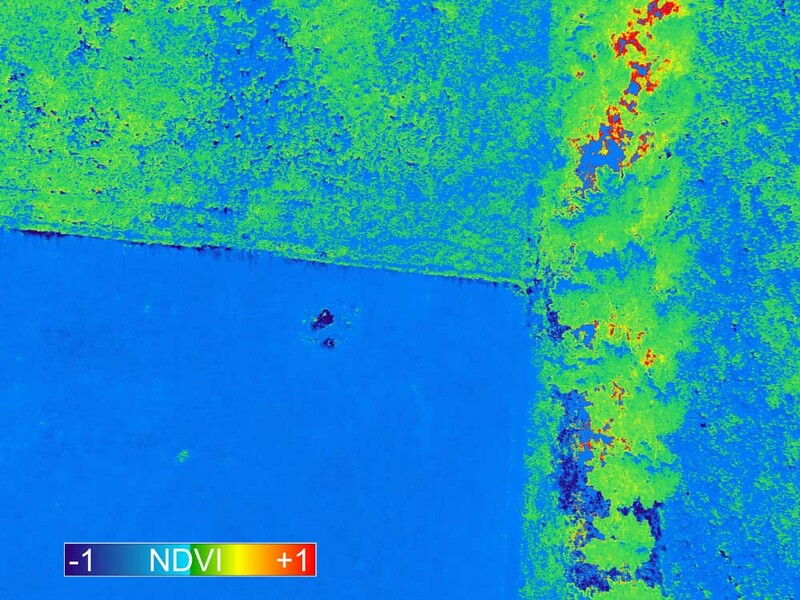 Above: NDVI using the red channel from the normal RGB photo for visible light and the red channel from the infrablue photo as NIR. Above: NDVI from the single infrablue image using the blue channel as visible light and the red channel as NIR. The pink photos are infrablue photos taken with a camera that was not custom white balanced. It would probably help to do that procedure. The pink photos were taken with a camera with a Rosco #2007 filter replacing the IR block filter. I guess you put the new filter on the inside. Fiji and Ned's Fiji plugin are free and can process single camera infrablue (Infragram) photos as well as dual camera (VIS and NIR) pairs into NDVI and false color IR images. It's too bad you were led to the Photoshop procedure, which is way harder and less precise than Ned's plugin. If you are going to use two cameras (one for VIS and one for NIR), you will get a more pure NIR channel if you replace the IR block filter with an IR pass filter like the Wratten 87. But then you will not be able to get NDVI from one camera. For a one camera system that provides a pure NIR channel, use a Wratten 25A instead of Rosco #2007 and the blue channel will be very pure NIR (use the red channel for VIS). The FPV video cameras you plan to use might have CMOS sensors which handle NIR light very differently than CCD sensors. So be prepared to do some testing. For example, I have not heard of anyone using a Wratten 25A filter in a CMOS camera. It's wide open territory. It looks like you are off to a good start. I'm using 1 layer of Rosco 2007 on the external side of the camera,,, it should be inside ? I'm planing to use 2 cameras, one for visible ligth and the other for NIR, on the NIR camera i have the rosco... to be honest if i order another filter i need to wait 2 months until the mail delivers the package to my house, we have a huge crisis in Argentina regarding shippings and packages from other countries. Regarding the FPV video setup, I ask a friend to help me with the vvvv code to compile the images, he will give me an update soon... the good news is that we have CCD cameras with and without IR filer... i guess we will get 2 cameras without IR filter and add the spare filter that we have from the Canon one,.,,, i will keep this post updated on this topic. Regarding Fiji... can you show me some tutorials regarding the steps to install the plugin and get the NDVI final results ? CHDK settings: It appears that you have the synchronous camera triggering working, so of the other CHDK settings for aerial photography the most important is probably shutter priority mode to keep the shutter speed high (~1/800 second). This is mentioned here and described here, but I think newer versions of CHDK work differently. Having the Rosco filter on the outside is fine, but it is not protected and not shaded from the sun (that's okay for vertical shots). The Rosco filter will give you a decent NIR image in the red channel. A piece of exposed, developed color print film (or unexposed developed color slide film) is a very good NIR filter -- it blocks most visible light and passes lots of IR. But it is not as optically clear and passes less NIR than a good Wratten 87 filter. I'm not sure whether Rosco 2007 or exposed film is a better NIR filter. Fiji tutorials: That would be a great thing to have. Installing Fiji seems to be pretty easy, and installing Ned's photomonitoring plugin is described in Ned's guide. Using the plugin is also described in Ned's guide, but it would be really helpful to have a video tutorial for that (especially on making the text file of photo pairs). Fiji and Ned's plugin are incredibly powerful tools for processing VIS/NIR pairs or Infragram photos, so it is worthwhile taking the time to figure them out. can you tell me the steps that you follow to process the image that you show me ? Did you use 1 or booth images ? Changing some of the parameters in the dialog boxes can have dramatic effects on the results. One of the options of the plugin allows you to create a text file by inputting directory locations and other things. Sometimes I can figure out how to make that work. It seems like we have different versions of the plugin. I'm not sure which is more recent, I think Ned might have to sort this out. If you click on "Dual image NDVI processing" you should see the second dialog window that Chris posted. If that's not working please let me know. I have not re-installed or updated the plugin lately. I'm not sure how Andre would have gotten an older version. I just updated the plugin and tested it. I suggest that Andre delete his version of the download Photo_Monitoring.jar and download the fresh version from Github. I'm not sure what the problem was or how long it's been a problem but hopefully this will fix it. This is the URL for the download page. If you click on "View Raw" the file should download. Please let me know if this works. I will start processing some images and upload them so we can see the results! Thank you guys!!! Chris I use all the same settings that you used and it made a huge change on the aligment,,, i also try adding some extra time when i create the list, on the max difference between offset... in my case its 0 because the cameras were sync,,, but if i leave 0 sometimes the pictures are not align,,, i will keep experimenting with this. Stewart got great NDVI results from his two GoPros, which have CMOS sensors. If you are using a two camera system like that, CMOS is not a problem because one camera records normally (visible light only) and the other is converted to record only NIR. It is only when you make a one camera system (infrablue or superred) from a CMOS camera that the differences between CMOS and CCD become conspicuous. Much more work is needed to learn how to make good NDVI from a single CMOS camera system. The problem appears to be getting a good visible light channel that is not contaminated with NIR. The NIR channel (red in infrablue and blue in superred) seems to be good. But when you remove the factory IR block filter from a CMOS camera, all three channels (RGB) seem to get lots of NIR light. So if you want to make a two camera system with a GoPro (or any CMOS camera), remove the IR block filter from one camera and replace it with an IR pass filter (which blocks all visible light) like the Wratten 87 or developed color film. If you instead replace the IR block filter with Rosco 2007, the red channel will be an okay NIR band, but the blue and green channels will probably be contaminated with NIR and not so useful. So if the visible bands in the converted camera are not useful, its better to install a good IR pass filter so you get a pure NIR image. 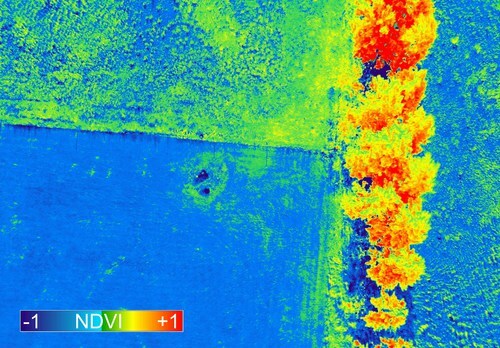 A dual camera system like that with one pure visible camera and one pure NIR camera will give NDVI results that are much easier to interpret and much easier to compare with legacy NDVI. Single camera systems are not as good, but they weigh half as much, need no electronics for synchronization, and require no photo alignment. So they have obvious advantages for aerial use and for casual users. Hey guys i have been offline for a while, with a lot of work and other projects, but now I want to continue with this! My question is,,, do I need to get a new rosco filter to try ndvi with 1 camera only? I followed this tutorial http://event38.wikispaces.com/NDVI+Processing+in+Fiji using one of the Ir pictures that I took on the previews examples and I did't get anything similar . I would like to be sure to have the right filters and workflow and then i will see if I can afford that camera. Which cameras are you having focus problems with? The A2300 does not have manual focus, so the best you can do is probably infinity focus mode which is automatic focus that only searches for focus farther than about three meters away. Is the problem focus or blur from vibration? The Nex 3 has a CMOS sensor, so for a one camera NDVI system it will probably work better with a red filter (Wratten 25A) than a blue filter. Are you going to try to remove the IR block filter?